At Geo-Solutions we are committed to ensuring the health and safety of our employees and any other person who may be affected by our operations at our jobsites and offices. This commitment comes directly from our President and CEO and has resulted in our excellent safety record, for example we’ve had an OSHA Recordable Rate of 0.0 for 7 out of the past 10 years! Choosing Geo-Solutions as your partner is the safe choice. We are extremely proud of our Health and Safety Record, Program and Standard Operating Procedures. This program places importance on management’s use of safe working practices and accident prevention techniques. Geo-Solutions’ site superintendents have overall responsibility for managing safety on our project sites. The superintendents are matched to each job site / assignment according to their level of training, experience, and past performance for completing assignments in a safe, professional, and efficient manner. Our superintendents conduct tailgate safety meetings at the beginning of each workday to discuss site safety issues from previous workdays as well as potential areas of concern for the work ahead. In support of the superintendents efforts to keep our projects running safely, all employees are empowered with no repercussions “stop work” authority to ensure that potentially unsafe conditions are identified and corrected. 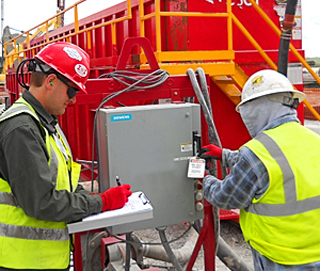 From the standpoint of training, all of Geo-Solutions’ field staff have received a minimum of 40-hour OSHA HAZWOPER training, current 8-hour updates, and are enrolled in a medical monitoring program with yearly physicals. Many on staff have received additional training including OSHA 10 or 30-hour Construction, 8-hour HAZWOPER supervisory, Powersafe, confined space, excavation safety, rigging and signalperson, first aid/CPR/AED, and radiological worker II training. Geo-Solutions’ safety department is managed by a Board Certified Safety Professional (CSP) and is structured to assist line management with regulatory compliance and optimize safety performance. The safety department oversees safety program development and management, training, auditing (at all levels of the organization), and case management. Geo-Solutions’ safety staff is available to all employees and customers 24 hours a day, 365 days a year. All incidents have root causes and it is Geo-Solutions’ objective to determine those causes and communicate them to the rest of the company through safety meetings, incident alerts, and other information that is disseminated throughout the company via electronic means and postings within the office. Most importantly, it is our policy to determine the root cause(s) and make the appropriate corrective actions and promote safety culture development. Incident prevention is an integral part of our corporate safety culture and therefore we stive to make sure it is seamlessly integrated it into our daily business practices. Geo-Solutions is committed to achieving safe production. We believe in protecting the safety and health of our own employees and that of other personnel who may be impacted by our work. We also believe that we can and must take the time to do our work safely and strongly believe that safety, production and quality can all work harmoniously to achieve our ultimate goal of zero losses. Management has the responsibility for health and safety; and therefore, is responsible for preventing incidents from occurring. Supervision must create a safe and healthy work environment, with assistance of appropriate personnel, safety and upper management who set the tone for our safety commitment. Health and safety must be an integral part of Geo-Solutions’ operations; and, therefore, must receive equal priority in every business decision and operation. Compliance with health and safety regulations is a job requirement on every project. Every Geo-Solutions employee is responsible for fulfilling their duties in a safe manner and, therefore, safety is a job performance requirement for all employees.